Some of Gods instructions (such as: If you want to be first, you must be last) appear to defy all common sense and wisdom. Yet, not everything that appears impossible is actually impossible. This chapter provides a powerful demonstration of this. The quiet buzzer rings twice causing everyone to get up and start performing their assigned duties. One person collects all of the dishes and puts them in a secret cabinet in the wall. Another person puts a new set of coffee cups on the table filled with fresh hot coffee. A table that was once set for ten is now set for three. Three people take their places around the table and the other seven run to the bedrooms. Carefully touching certain spots on the wall they unlatch a panel leading to a secret hideaway. Their evacuation flowed smoothly. They had practiced it so many times it was almost second nature. All tell-tale signs of the fugitives have been meticulously eliminated. The front door flings open and eight German soldiers rush in. The soldiers search the entire house and find nothing. They report their findings to their leader, a short balding man in a black leather jacket. He smiles sinisterly as he hears the news. As the Gestapo agent slowly blows smoke out of his mouth, he coldly examines each person at the table. Running his fingers along the surface of the cherry dining room table, he says, "Not everything is the way it seems." Taking a final drag on his cigarette, he extinguishes it on the table, disfiguring its beautiful surface. The Gestapo agent casually walks upstairs to one of the bedrooms. Walking directly to a wall, he puts his hands on the secret latches and exposes the hiding place. Terrified, the Jews huddle in the corner of their hiding place. 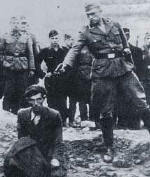 The Gestapo agent pulls out his gun and points it at one of the Jews. Cocking the hammer of his gun he says, "Just like I thought; your house is infested with vermin." Although the owners of the house had been very careful to eliminate all traces of their activities, their hiding place had still been discovered. In this situation, it didn’t matter how careful they were, the Gestapo agent knew exactly where the Jews were hiding. An informer had tipped him off. Ironically, the informer wasn’t an Aryan who hated Jews, but was a Jew himself. Many Jewish people knew what the Germans were doing to their fellow Jews and they were terrified. 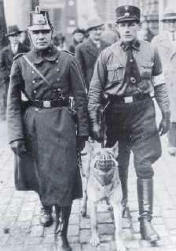 As a result, some of them became informants for the Nazis in exchange for preferential treatment. They sacrificed the lives of others to save their own. While this betrayal initially saved the informers from the Nazi’s violence, most informers ultimately ended up being killed. Was betraying their friends worth it? For the sake of argument, let’s say that this betrayal did save the informant’s life. Was it still worth it? Would the informant be consumed by guilt and shame the rest of his life? When you compare this short life here on Earth with all of eternity, did this betrayal really profit him? In contrast to these informants, you had other people who did the opposite. These people were not Jews and could have been left alone (relatively speaking) by the Nazis if they didn’t interfere with the "final solution." Yet, many of them risked their own lives trying to save Jews. Many of these people ended up in death camps for protecting Jews. The Ten Boom family is a good example of this. This Dutch family felt that the Germans' treatment of the Jews was despicable, so they used their home as a safe haven for Jews until they could be smuggled out of Holland. They saved many Jewish families before they were finally caught. As the Ten Boom family was being loaded into a German transport truck, a soldier pulled the father aside to talk to him. He felt sorry for this elderly man and he knew he wouldn’t last long in jail. The soldier told Mr. Ten Boom that if he promised to stop this activity, he would let him go. Mr. Ten Boom politely said that if he were to be released, he would be hiding Jews by the end of the day. He was taken to jail and died shortly thereafter. Corrie Ten Boom and her sister went to Ravensbruck, a Nazi death camp, for harboring Jews. They both endured incredible hardships and only Corrie survived. Many people risked their lives to help save the Jews from the holocaust. To show their appreciation, Israel set up the Holocaust Memorial (Yad Vashem) in Jerusalem to honor those who helped save Jews from the Nazis. There are 8,611 "Righteous Gentiles" who are honored there. Israel also planted a tree for each of these Righteous Gentiles in memory of what they did. (Source: Atlas of Jewish History, page 104). The Ten Boom family followed the Biblical instructions of treating others the same way Christ would have. They deliberately sacrificed their home, health, and even lives to help others. Although they behaved in a way that cost them everything, it actually produced the opposite results. The Bible has many instructions that seem to defy all understanding and wisdom. They just don’t make sense. For example, the Bible says that in order to be first, you must be last (Mk. 9:35, 10: 31). It also says that in order to truly live, we must die to ourselves (Mk 8:35; Lk. 9:24). The Ten Boom family is a great example of these verses. When they died to themselves, God created life through them. Before and during their imprisonment, they were able to change many lives. After the war, Corrie Ten Boom became a powerful testimony of the love and forgiveness of God. More important, however, they traded in their earthly life for tremendous eternal Heavenly rewards. They reaped a tremdous increase in this swap. Trusting God and understanding the reasons behind some of His instructions is not always easy. However, if God’s Word clearly tells you to do something, you should just do it. Be completely obedient and leave the rest to God. If God is the author of the instructions, let Him work out the details. Let God produce the results, even if the results seem impossible. I have a fascinating demonstration that will illustrate this point. This demonstration will produce a result that appears to defy all common sense and reasoning. This demonstration will show that you can face adversity, pressures, and impossibilities head-on and still come out victorious. This demonstration involves a leaf blower or some other type of blower (please refer to the chapter Setting up the Demonstration for specific details). If you take this leaf blower and point it toward some leaves, the leaves will obviously blow away. If you move the blower closer to the leaves, they will fly away even faster. The closer an object gets to the leaf blower, the more pressure will be applied to it. If someone were to ask you, "What would happen if you put a disk at the end of the blower?," you would naturally say that it would be blown away. To prove your point, you would start out by putting a disk about two feet away from the blower. At this point you can feel the air pushing against the disk. You feel more pressure being applied to the disk as you move it closer to the blower. As you complete your demonstration (by moving the disk right next to the blower), you suddenly find the disk being "sucked" up against the blower. You’re probably wondering how the disk is being sucked up. Look at the chapter Explaining this Phenomenon for an explanation. Regardless of how it happens, we can still draw two valuable lessons from this demonstration. First, it shows us that it is possible to have something appear to defy all common sense and conventional wisdom and still be correct. Therefore, since God’s Word is true, we can trust its instructions completely, even if it doesn’t always appear to make sense. If God’s Word clearly tells you to do something, you should do it even if it seems to defy all common sense and logic. The second lesson we can learn from this demonstration is that complete obedience is essential. We saw that putting the disk only half way to the blower only resulted in pressure and opposition. Likewise, if we are only halfway obedient to God’s command, we will probably run into a great deal of pressure and opposition. We will not see the fulfillment of God’s promise. When a person is completely obedient to God’s instructions, God works out the details. For example, when the children of Israel were ready to go into the Promised Land, the Jordan River was blocking them. God told the priest to pick up the Ark and walk into the river. As soon as they stepped into the river, the water parted (Joshua 3:15, 16). The water didn’t open up when they were close to the river; it only opened up when they stepped into the water. If they had stopped five feet from the water and waited for God to perform His miracle, they would have been greatly disappointed. This demonstration of the leaf blower can be a great visual aid to teach people to trust God and the Bible. (You can even use a shop-vac (exhaust port) or a hair dryer to do the demonstration.) The following chapter provides a skit that I think your church would enjoy. 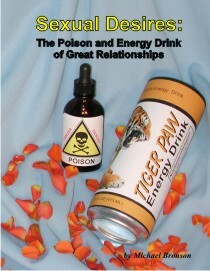 With a little imagination it can be modified for an older or younger audience.